The deadline to register for assistance has passed. All the Disaster Recovery Centers in North Carolina have closed. The closure of the Disaster Recovery Centers marks a major milestone in the disaster recovery process.The Centers close when traffic slows at the locations. Visit DisasterAssistance.gov to log into their account. 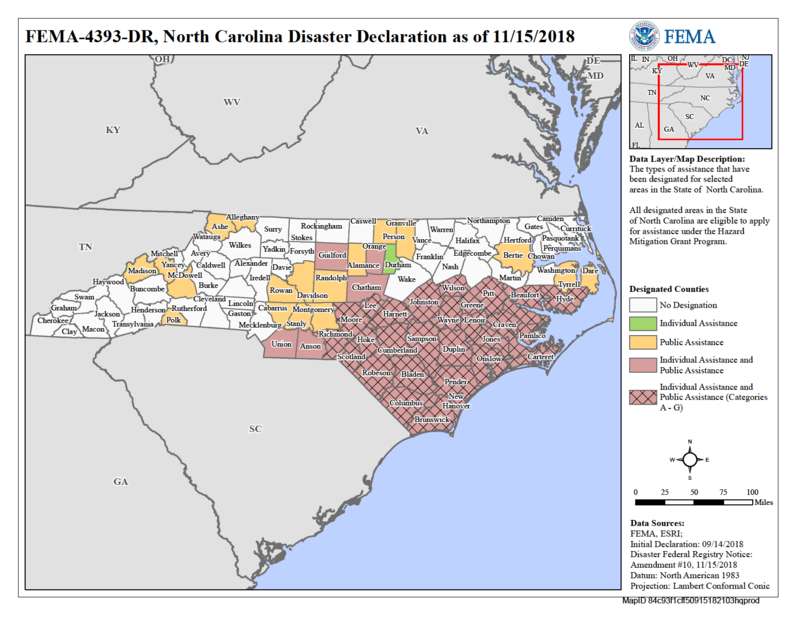 The NC 211 statewide information line can provide callers with nearby shelter, housing and other storm-related details. Dial 2-1-1 or 888-892-1162 (TTY), or text Florence to 898211. The information line is staffed around the clock to connect North Carolinians to storm resources. Manufactured Housing Units (MHUs) provide a longer-term solution for survivors whose repairs will take longer to complete due to greater degree of damage. There are currently 7 state housing recovery centers open to provide rental assistance, housing leads, and financial information. Below are their current locations and hours. 8 a.m. to 5 p.m. Mon. to Fri.
9 a.m. to 5 p.m. Mon. to Fri.
134 Office A Industrial Park Dr.
8 a.m. to 5 p.m. Mon to Fri.
What is Mitigation? Mitigation is the effort to reduce loss of life and property by lessening the impact of disasters. In order for mitigation to be effective we need to take action now—before the next disaster—to reduce human and financial consequences later (analyzing risk, reducing risk, and insuring against risk). It is important to know that disasters can happen at any time and any place and if we are not prepared, consequences can be fatal. Disaster survivors can get tips and advice on how to rebuild stronger against future storm damage from FEMA flood mitigation specialists at select hardware and home improvement stores for a limited time. The specialists can answer questions about home repair, making disaster plans, putting together supply kits and the importance of flood insurance. Residents can also learn more about how to make their homes more resistant to flood damage at community mitigation resiliency workshops. If you want to get involved in response and recovery efforts, you should first connect with an established team. A list of reputable volunteer agencies is available on the National Voluntary Organizations Active in Disaster website at nvoad.org. Or, visit VolunteerNC at nc.gov/volunteer. North Carolina officials ask that volunteers not self-deploy because unexpected arrival in affected communities creates an additional burden for first responders and may fill lodging needed by survivors. To ensure your financial contribution is used responsibly, only donate to reputable organizations. Visit the NC Disaster Relief Fund at governor.nc.gov/donate- florence-recovery and click “Donate to Hurricane Recovery,” or text “FLORENCE” to 20222. Never forget – cash is best! A financial contribution to a recognized disaster relief organization is the most effective donation to make. Your home may be contaminated with mold, which raises the health risk for those with asthma, allergies and breathing conditions. A rumor control page has been set up to dispel false information about Hurricane Florence. Download the FEMA mobile app (available in English and Spanish) to receive emergency alerts and find a shelter. Free and available on Apple and Android devices. Beware of post-storm donation scams. Research before you donate and only donate to reputable organizations. In North Carolina, visit the NC Disaster Relief Fund and click “Donate to Hurricane Recovery,” or text "FLORENCE" to 20222.